Welcome to Wide Angle Software's iBackup Extractor User Guide. This document will guide you through the steps to using iBackup Extractor. iBackup Extractor is designed to find all your iPhone, iPod Touch and iPad backups stored on your computer and to provide an easy access to the data stored in them. You can explore your iPhone backups and view and extract your Calendars, Contacts, Notes, Messages, Photos, Internet browsing history, Voice Mails and your iPhone call logs. iTunes creates a backup of your iOS device data whenever it syncs to your device. With iBackup Extractor, you can browse through the contents of these backups, without needing to connect the device itself. With a single-click, you can extract any file from your iOS device backup. Simply download and install iBackup Extractor as detailed in our Quick Start Guide, choose the file you wish to extract and click "Copy". These help pages will guide you through using iBackup Extractor and its multiple features. 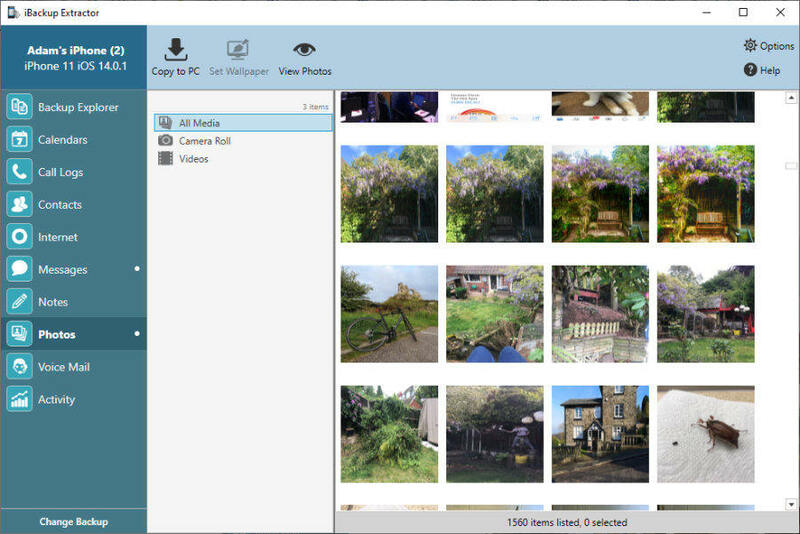 The demo of iBackup Explorer only allows up to 20 items to be transferred. This restriction is removed when the demo is registered. See the iBackup Extractor Terms and Conditions for more information.